USB Implements Forum (USB-IF) announced a partnership with Silicon Valley giants - Google, Apple and Microsoft - to develop a new Human Interface Device (HID) standard for Braille displays. The three major technology companies will also work with other USB-IF members such as auxiliary technology companies (ATs) and non-governmental organizations advocating the interests of the blind. The new standard is expected to facilitate different operating systems and devices to feature Braille features. Currently, blind people and people with poor eyesight should install different hardware and software just to use the computer. 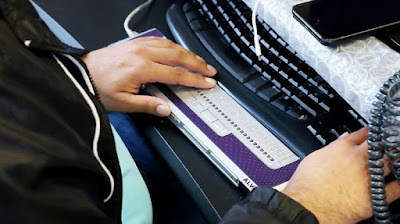 "Braille is the key to literacy, education, employment and success for the world's blinds.HID standards that enable seamless integration of Braille displays across devices will make it easier for Braille readers to use this essential tool at home, at school, at work or wherever , "said National Federation of the Blind President Mark Riccobono, in a statement. This collaboration is expected to advance technology for people with disabilities and create a consistent approach for AT providers. Microsoft said this standardization of HID in addition to improving the implementation of display braille will also reduce the time and cost for marketing, and ultimately empower blind people and weak vision. This standard itself is expected to be adopted by developers in 2019. 0 Response to "Three Technology Gigures Develop a New Standard of Braille Display"